I was inspired to have my first giveaway of a coffee cozy with a handle. I thought that was a cool idea. 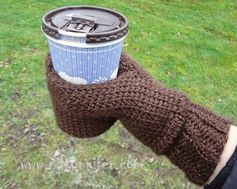 It has nothing on THIS beverage mitt made by the Niftynnifer's Crochet & Crafts blog. Wowzas! !